I completed a year and above offroading / driving my Classic after I completed the Mahindra Classic restoration project. What to look at now, first thing is the odo meter opps it showed 40,000 odd kms and it was 24360kms when I possessed the Jeep. Hurry more than 17,000 kms(including 1000kms of no speedo cable drive) long association with my Jeep has completed with in a year time. I'm looking forward to grow this relationship as much as I can do. 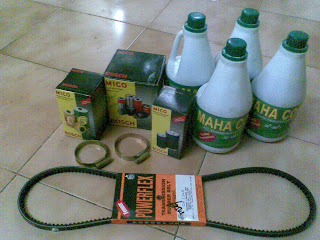 Between the last oil service and now the jeep has completed 6,000kms and time to change engine oil, oil filter, diesel filter and fan belt. So rushed to the garage and got a request from my mechanic to service the radiator. Why to take risk added the request execution. My jeep service is completed. The result of this service was evident in yesterday's night offroad which we did over the kelambakkam area of Chennai. We had bunch of cool offroader did a really satisfying offroad event as the dark added more fun to our OTR. 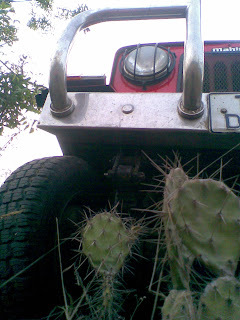 Though the terrain was rough like the cactus plants seen out there the jeep engine revs felt smoother now. As it is hot summer season the radiator service really helped me to attain cool engine and I added 4 liters of concentrated coolant to the radiator.